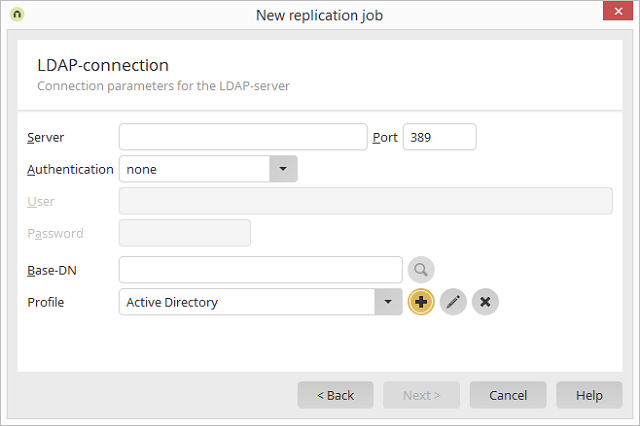 Users module User menu / User and group import Replication source / Add Select LDAP / Click on "Next"
Specify the source server of the LDAP directory (e.g. the domain controller). (such as john.smith@Domain.com or cn=John Smith,ou=IT,dc=YOUR_DOMAIN, dc=US) and enter their password. The base DN (distinguished name) is the name of the sub-tree that the users and user groups should be imported from. Opens a dialog where the base DN can be selected. Select an appropriate profile here. Opens a dialog where a new profile can be created. Opens a dialog where the profile can be defined. Deletes the currently selected profile.